Ice Cream French Toast-ice cream is the secret ingredient to making the BEST French toast. Trust me, you HAVE to try this recipe! 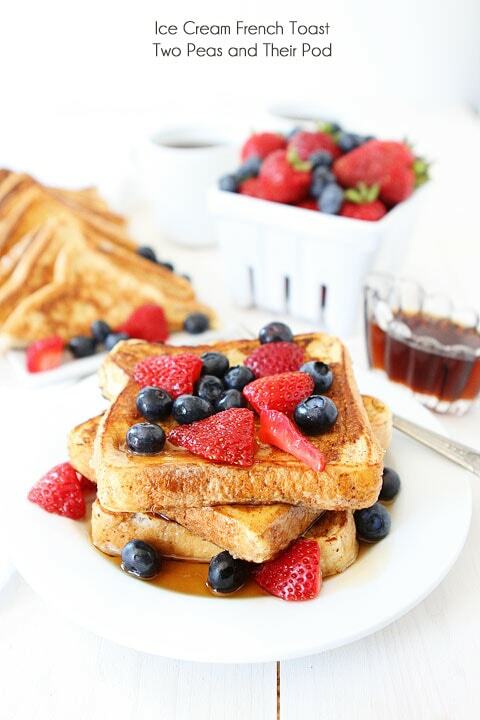 I am a sucker for French toast. I order it almost every time we go out to breakfast. When I was in Seaside, Florida I had the French toast at Pickle’s and it was SO good. I complimented the owner, Heavenly, on her fabulous French toast and she shared her secret. She uses ice cream to make the French toast. No wonder it was so good! Such a genius idea! When I got home, I told Josh we needed to make French toast with ice cream. He was game! So we made Ice Cream French Toast and it is now our favorite French toast recipe! You’ve gotta try it! 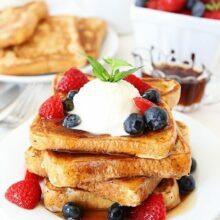 Since July is National Ice Cream Month, I thought it would be appropriate to share our Ice Cream French Toast recipe with you all! The more ice cream the merrier! So the secret is to use melted vanilla ice cream as the French toast base…instead of milk or heavy cream. Again, genius idea! I don’t know why I never thought of using ice cream before! 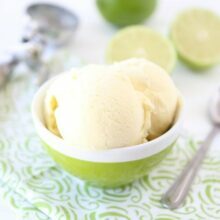 Make sure you use a really good vanilla ice cream to get the best results! We added a little vanilla and cinnamon to our ice cream and egg mixture. We dunked Texas Toast into the mixture and cooked the bread to perfection! We ended up with the BEST French toast. 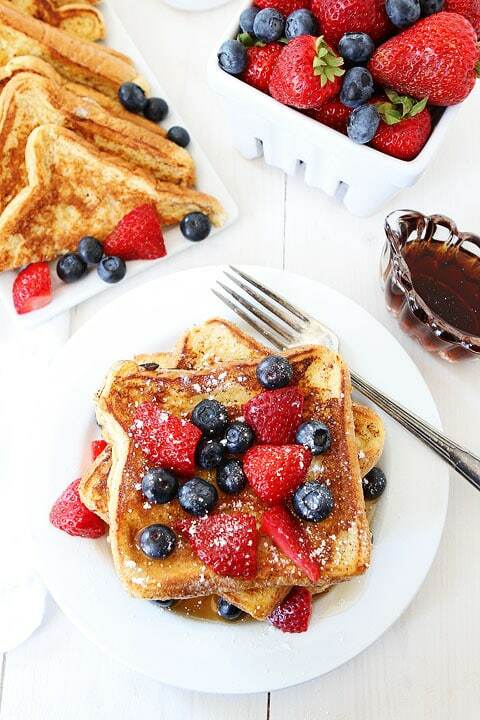 We topped the French toast with maple syrup, fresh berries, and a dusting of powdered sugar. We also added a scoop of vanilla ice cream because why not? It is ice cream month! 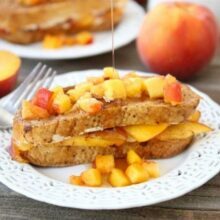 If you are looking for the BEST French toast recipe, look no further, you’ve found it! This Ice Cream French Toast is pure perfection! 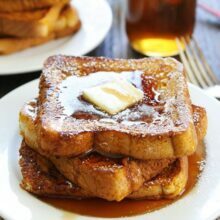 I’ve eaten a lot of French toast in my lifetime and I am seriously smitten with this recipe! Ice cream is the secret ingredient to making the BEST French toast. You HAVE to try this recipe! Preheat a griddle according to the manufacturer's instructions. In a shallow baking dish or pie plate, combine the melted ice cream, eggs, vanilla, and cinnamon. Whisk until blended. Dip both sides of each slice of bread into the egg mixture, allowing the bread to soak up some of the mixture. Spray the hot griddle with non-stick cooking spray, cook the bread in batches until golden and crisp, 3 to 4 minutes per side. Note: If not serving immediately, keep warm in a 250 degree F oven until ready to eat. Sounds yummy ! Must try it out !! When is the little one due to make a debut ?Good luck! Hi! I love french toast too, but it never occur to me to use vanilla ice cream as base. 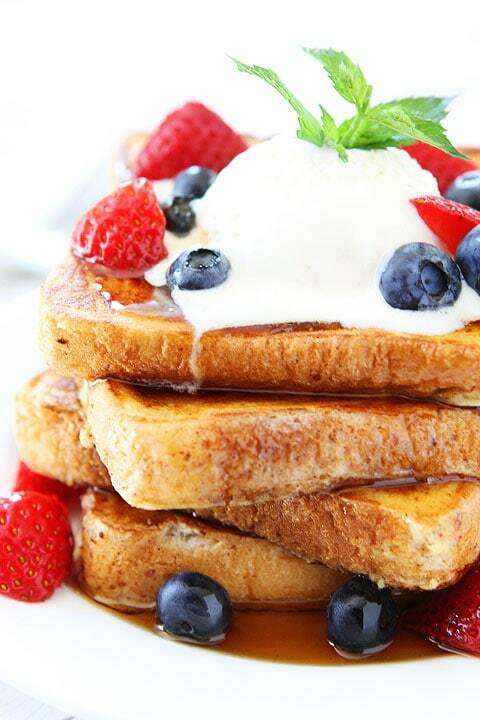 Now Heavenly’s french toast recipe is not so secret anymore. By the way, is the restaurant owner’s name really Heavenly? Thanks for sharing. I’m the same way if I’m going out to breakfast french toast is the way to go. I’ve never seen it with ice-cream but why not? Looks good and you never steer me wrong! Just when I thought that were NO OTHER WAYS to make french toast creative, you made it with ice-cream. And I LURVE you for it. this is ah-may-zing! Pinning! This looks awesome! 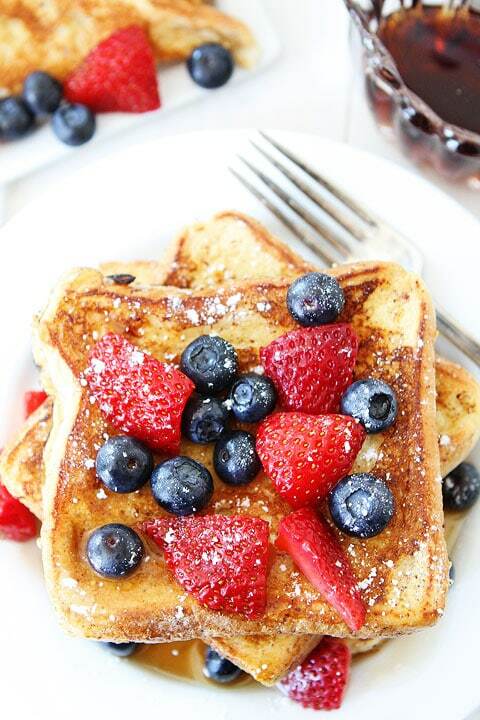 Such a beautiful french toast! Love this breakfast for summer Sunday mornings!!! This is such a cool idea! I love the ice cream mixed with the eggs! This is the most amazing idea ever!! Genius, genius genius. Why haven’t I thought of this? LOVE. This is totally genius! It’s so easy and I’m sure it tastes amazing. Plus, I bet other flavors would work to mix things up. 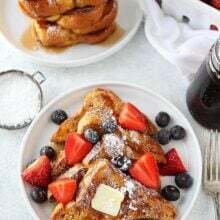 French Toast is always my go to breakfast when I go out too Maria! My secret for making it at home is to cook it in bacon grease……I will have to give the ice cream a try next time! 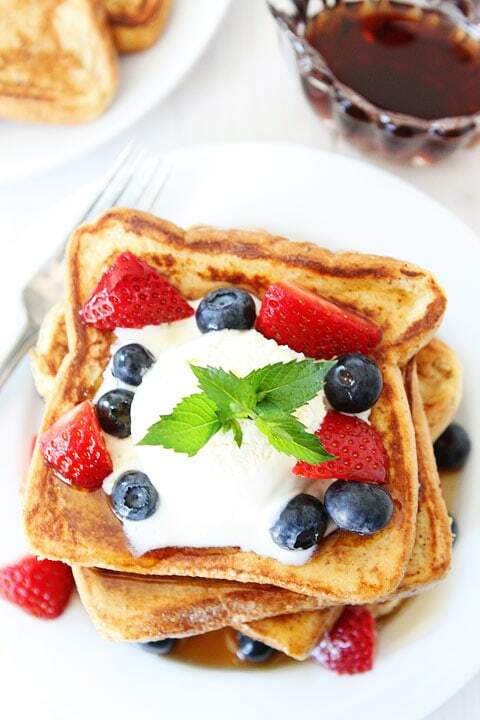 French Toast with ice cream and berries? Does it get any better than this? I love getting French toast at restaurants too. I’m sure the sugar in the ice cream makes for a crispy delicious crust on the French toast. Ice cream for breakfast! Yum! GAH!! I could go for a huge stack of these!! Omg, Maria. I need this in my life ASAP!!! Wonderful recipe & great photos!! OMG- I love this idea. I’m trying it today!!! This looks divine!! 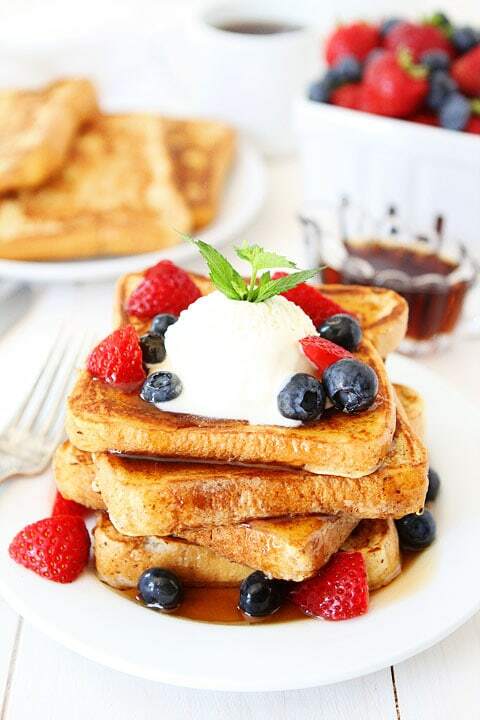 Ice cream and french toast – what could be better?! That is such an awesome way to make french toast!!! Breakfast will never be the same!! Ice cream with breakfast?! Sign me up! This looks delish! Genius! Love the idea of using ice cream in place of the cream/milk! I bet it would be super tasty with other flavors, too. Like butter pecan or dulce de leche! Yum! pretty sure the only way to make French toast better would be ice cream. love this!! What! This is so creative, but sounds so delicious! I will have to try this when I get home! What a fun recipe! I can’t wait to try it! I LOVE this idea – it looks and sounds amazing! I was wondering if you had a vegan version of this recipe. My son is allergic to eggs. Otherwise, it sounds yummy! Thank you. What a fun idea! I wouldn’t mind adding a little ice cream to my breakfast! I never would have thought of that, but it seems brilliant. And awesome. So awesome. I’m hungry now!! We love Tillamook and Haagen Dazs ice cream! Oh, this looks so delicious. Very creative using the melted ice cream! Oh my goodness! This looks delicious. I have always loved ice cream on waffles as a breakfast treat. Now I will have to try this. Great idea! Ha, what a genius idea! !